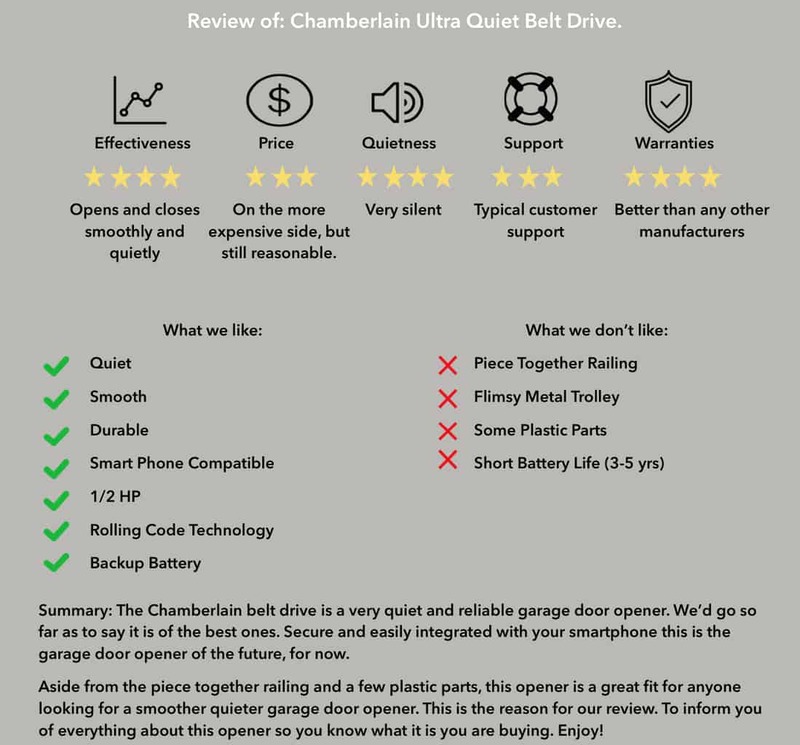 Could The Chamberlain Ultra Quiet Belt Drive Be The Best Garage Door Opener Out There? Imagine this. You got a new job and now have to wake up early in the morning, say five am. You get up all sneaky like and brew your tasty morning cup of heaven without waking anyone. Stepping into the garage you breathe a sigh of relief. So far so good. You get inside your car and push the garage door remote. What in the world were you thinking?? Your wife/husband is now standing in the doorway with your toddler staring daggers at you! Oh boy, sounds like you’re ready for a new garage door opener and possibly some underwear. The Chamberlain belt drive is perfect for this particular situation and so much more! ===> No time to read all this incredble info? Here’s the best deal we could find for a Chamberlain belt drive. So what’s our reason for this review? Well, for one, its our job now. Two, this has been reportedly the best garage door opener available to the public. We’d like to go over the product top to bottom and either dispell or confirm this theory. A couple questions you can expect to be answered are as follow. 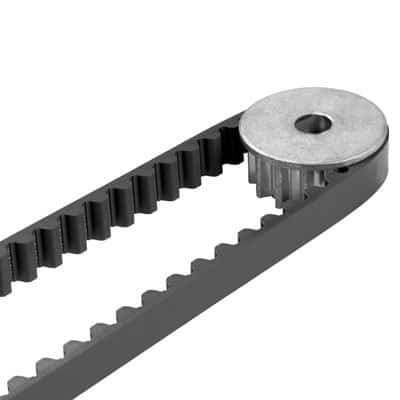 What makes the Chamberlain belt drive so awesome? 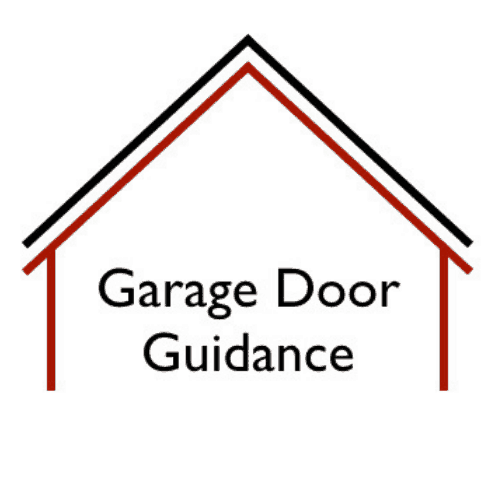 Why is it better than other types/brands of garage door openers? What’s different about it? What are some pros and cons of this garage door opener? 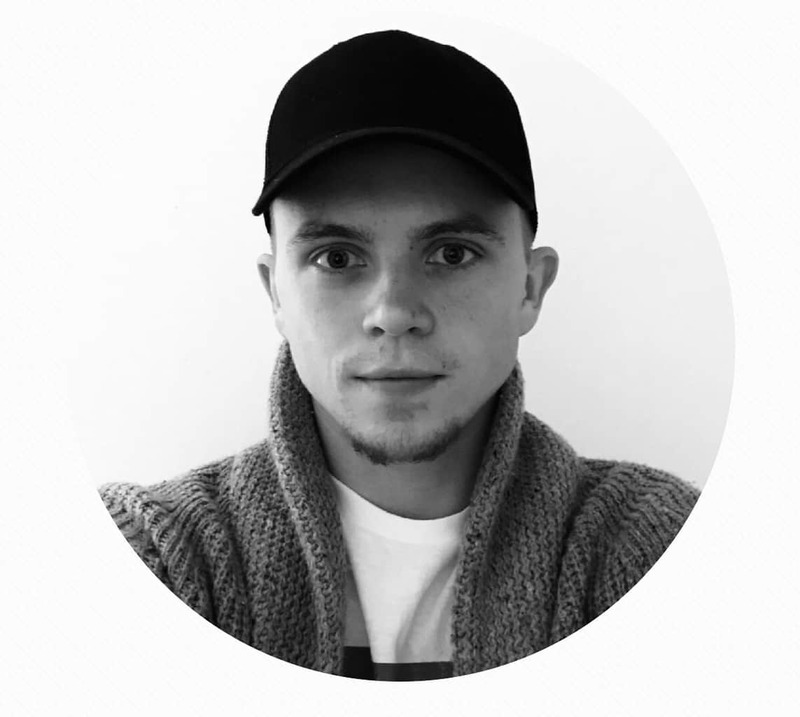 How reliable are these openers? We’ll do our best to answer all these questions and give you our full review of the operator from start to finish. What do we think about the chamberlain belt drive? We chose to buy Chamberlain because of all the positive feedback we read online and heard around. In our opinion it is definitely a very smooth and silent unit. Also the backup battery feature is great since the power often goes out in our neighborhood. The fact that we can work the door with our phone is just amazing and we can hardly believe we lived without this techhnology for so long! The number of times I’d driven back home to check if i’d closed my door fully is preposterous. Now that is no longer a problem. All I have to do is open the app and check if it’s open. It even tells me what time it opened and what time its been open since. How great is that!? This feature is worth the money alone. This is one of the reasons we went with this opener. Alongside the level of noise it produces, which is minimal. Overall a great unit and we certainly love the smartphone wifi feature above all else. The soft start and close makes the door seem so much smoother throughout the opening/closing process. 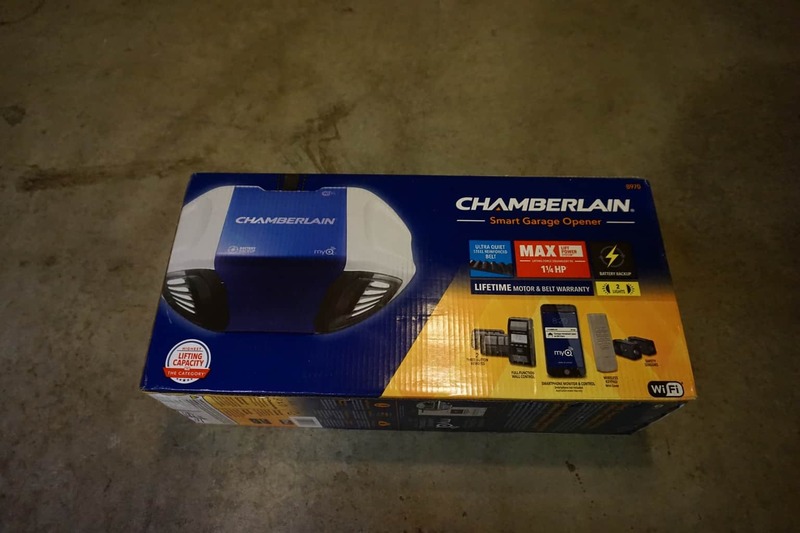 If you’re looking to upgrade your garage door opener this Chamberlain should definitely reserve a spot on your list of considerations. If not be the ony one on the list! We put the opener together and installed it ourselves. We are just incredibly talented like that. You can however hire someone to do the installation for you should the task prove too much for you to handle. Take solace in knowing you’re still saving money by providing your own product and not using a companies provided opener. Typically you can expect to pay anywhere from $100-200 for installation. You still save roughly $50-125 when you buy the garage door opener yourself so dont worry if you aren’t up for the job. Heck your time may be more valuable than trying to knock it out on your own. We had purchased our Chamberlain through amazon and it came with a few extras. We honestly didn’t need much as once we got our phone to work for it, nothing else seemed to matter. 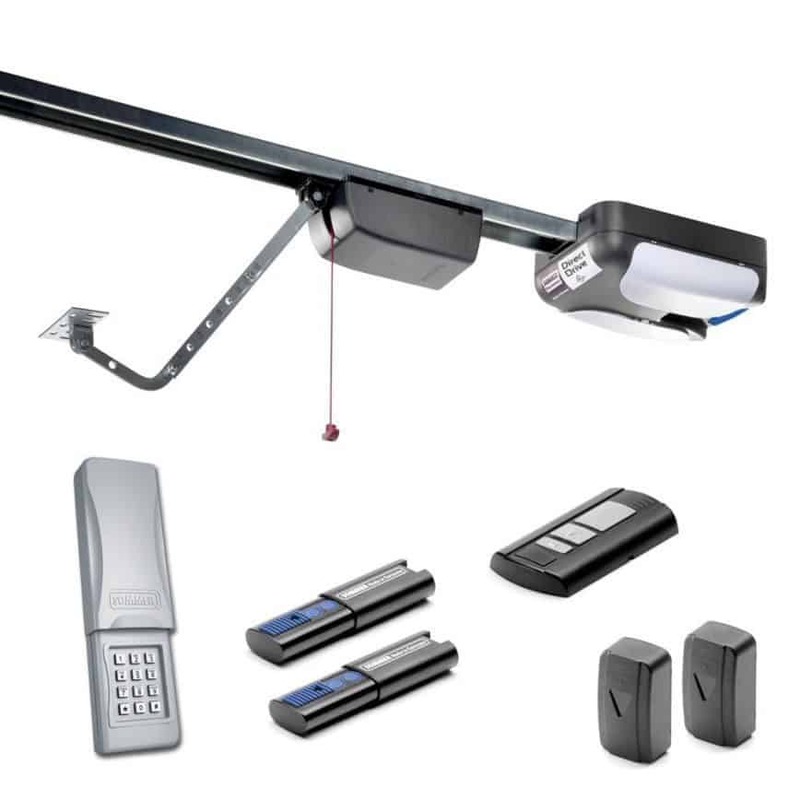 Why do we believe this is the best garage door opener available? Put simply there arent any options above this one. This IS the best door opener you can buy. I will say, however, that contractors have access to Chamberlains Liftmaster products. You can actually buy the motor head for the Liftmaster model 8550w online but you can’t get the solid rail that contractors get when they buy the same product. 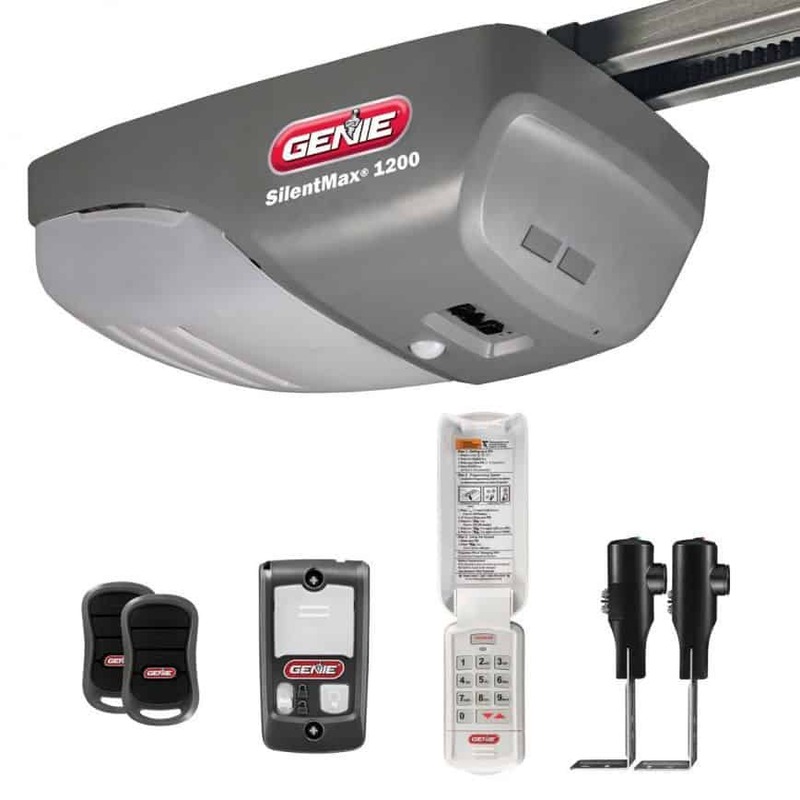 In our opinion this is the only garage door opener that is better than the Chamberlain ultra quiet belt drive. Although all the parts are the same, you get a solid rail with creates a stronger and sturdier ride. Aside from that they’re essentially the same opener. ==> Ready to pick up the belt drive? Click here to get the best deal for the best door opener. 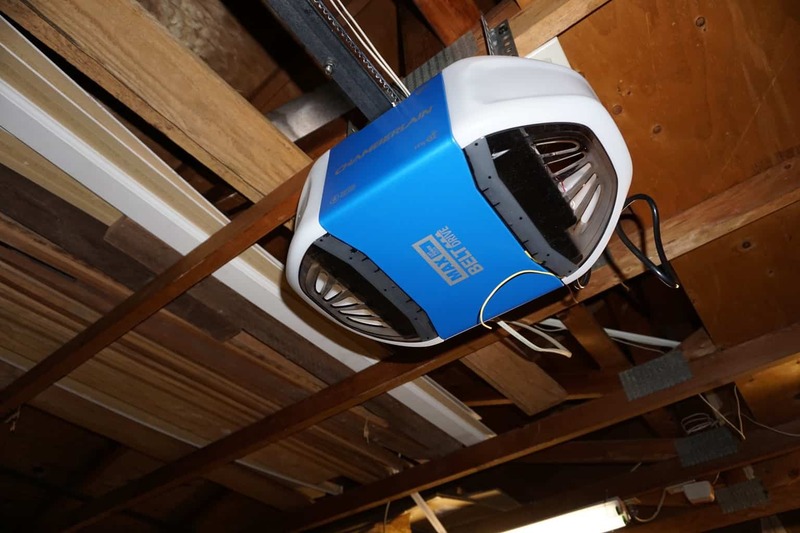 When installing this garage door opener we made sure to take note of good and bad things as the install progressed. We’ll put down the list of items we’ve come up with. Although there are a couple cons when it comes to this opener, we feel the pros outweigh them by a ton. For example the motor lets out a bit of whine as it opens and closes. We would’ve liked to see these certain features built a little better but they aren’t something that would change our mind about buying this belt drive. Judge for yourself as you read our list of pros and cons. They are labled down below, enjoy! Once we had installed our garage door opener it came time to test it out. It worked beautifully! Of course we ran it up and down quite a few times so we could get a feel for how it worked and what it would sound like. Safe to say it will take some time to get used to the reduced noise level, but thats not exactly a complaint! We’re very happy with the belt drive and almost look forward to opening and closing the garage door now. Check out the video of the final product. After a while even the neighbors complimented us on how nice our garage door sounded. They used to be able to hear us everytime we opened the garage! Not any more. Life is more fun when you get excited about the little things. Finally ready to take the leap? Pick up your ULTRA QUIET belt drive here. The LCD wall control has a bunch of options too, which is pretty cool considering you’re usually limited to a button, light switch and lock button on basic garage door openers. The wall control on this garage door opener has a timer to close, lock button, programming button, three language options, and also displays the time, temperature and battery life! There’s a sentence full for ya. What else can we say? I feel we’ve covered just about everything and hope you can now decide for yourself whether or not this is the best garage door opener or not. We certainly love it! To conclude this review, this garage door opener is incredibly capable of opening and closing your garage door. With more than enough horsepower and a belt reinforced with steel, it’s sure to last for quite some time. Being able to control the operator with a smartphone, due to the wifi capabilities, is an incredible feature we will use throughout this openers life span. This will save us so much time and worry by not having to drive back home to make sure the door closed. As for being the best garage door opener available, we’d have to say yes as of now. Genie has a similar model but without some of the features this Chamberlain has. Also the Genies seem to have a ton of technical issues as of late and therefore are deemed unreliable. 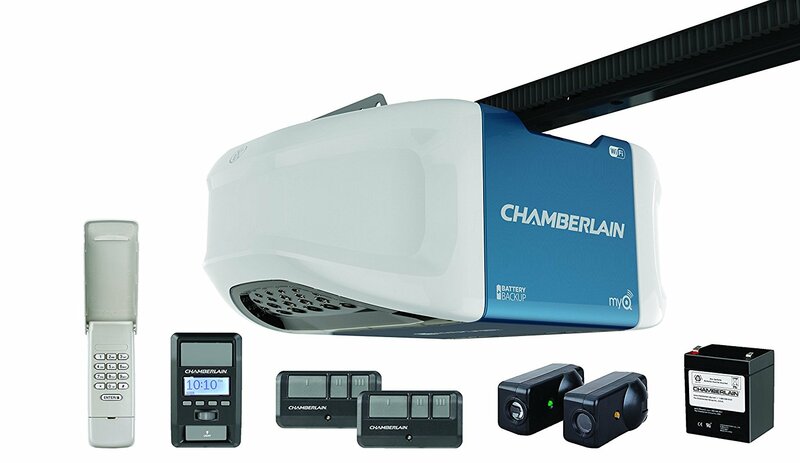 Ryobi, Craftsman, Guardian, and Sommer garage door openers just can’t compete with Chamberlain. They’ve got their work cut out for them. We highly recommend the Chamberlain belt drive. Seriously there isn’t a better option you can buy on your own. We hope to have answered any questions you may have had relating to this particular garage door opener. If you manage to think of something we didn’t cover, send an email and we’ll try to answer it to the best of our ability. So even if you decide not to install this opener yourself, save some money, order the opener and pay someone to install it for you. You still win by saving $50-100. Thanks for reading! Hope this review was enjoyable as well as informative. Leave a comment/share this with your friends! Have an awesome day! Get the latest deals on openers and accessories along with updates to our blog and review pages!